...the Scarab buzzed into the great workroom as any intruding insect might, and sought the security of a shadowed corner. Is the key to micro air vehicles (MAVs) to be found in the bio-mechanics of insects? John Loughmiller, an electrical engineer and commercial pilot writing in Design News, thinks so. 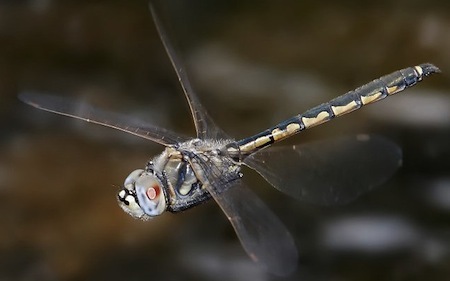 Note the positions of the Dragonfly’s four wings. The two front wings are in a stable position in this still frame and appear to be generating equal lift. The two back wings however do not match the position of the front wings nor do they match positions relative to one another. It appears that this Dragonfly is in the process of executing a lateral maneuver from a hover by inducing drag with the rear wings in unequal amounts. The resulting complex vortices can only be analyzed using Computational Fluid Dynamics. When the Dragonfly is moving forward, the two sets of wings are flapped in phase, generating lift and directional momentum. When hovering however, the rear wings are intentionally flapped out of phase, with both the angle of attack and relative position of the front wings, which generates drag preventing motion relative to the earth but still generating lift. By decoupling one rear wing’s movement from the other, the insect can also move side to side. All of these maneuvers require understanding of the vortices involved, because the vortices cancel or enhance lift as they interact, so a flexible CFD toolset is required. But if these motions can be duplicated mechanically, they could give a micro-robot the ability to move rapidly from one location to another and then hover for purposes of surveillance. All the while the micro-robotic mini-spy would be generating an extremely small visual and Radar footprint plus an equally small noise signature. Capabilities like these are of great interest to the military and law enforcement. Read other detailed examples at Design News.